Ooops, an unexpected beheading in Game of Thrones had you flinging your cereal bowl into the air and onto the couch (we’ve all been there). Before you wet the stain with your tears and list the sofa on Craigslist, try cleaning the spill—and any others you’ve been ignoring—with one of these methods. When was the last time you vacuumed your sofa? Sure, you brushed away the cereal crumbs after your last Netflix binge, but are you sure you got everything? 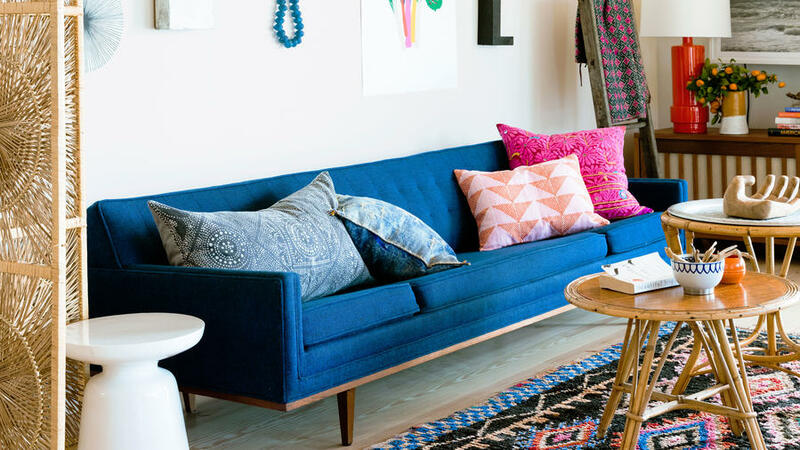 Any particles left behind, no matter how small, eventually get ground into the fabric, making your sofa look dingy and maybe even creating a stain seemingly out of thin air. There’s an easy solution: a quick swipe with the hose or upholstery attachment of your vacuum cleaner. Do this once a week (or, ok, twice a month) on all your upholstered pieces and you’ll notice fewer mystery spots immediately. Remove any particles with a vacuum. Test this solution on an inconspicuous spot of the fabric (try underneath where the fabric is stapled to the frame). If all is good, blot the spot with a white or light-colored cloth dipped in the soap and water solution. Never rub the spot; it just grinds the stain deeper into the fabric and can damage more delicate fabrics. “Rinse” the area with a white or light-colored cloth dipped in plain water. Blot dry with a dry towel. Try the method above on old stains, but if they survive that gauntlet, it’s time to bring in more firepower in the form of upholstery cleaning solvents. There are many available on the market from gentle water-based ones (we like nontoxic, petroleum-free Folex) to dry cleaning solvents. W: Use a water-based detergent (like clear dish soap and water, or Folex). S: Use a water-free solvent, often called a dry-clean solvent (like the Chemspec or KleenRite lines). Follow the instructions to the letter for best results—and for your own safety. These are potent chemicals. WS: Use either a water-based cleaner or dry-clean solvent, depending on the stain. X: Don’t touch! Let a professional upholstery cleaner handle this one. Wine spills aren’t the end of the world if you act before the wine has a chance to sink into the fibers. To clean a wine spill, blot all excess wine away immediately. (Don’t rub!) Wet the area with club soda to dilute the wine and help lift it out of the fibers, then blot again. Repeat as necessary. If the stain remains, wash with the clear dish soap solution described above. Grease needs special treatment. The key is to absorb the oil, then remove it. Sprinkle the stain with cornstarch and let it sit for about 30 minutes. Vacuum the cornstarch and check the spot. If it’s not totally removed, repeat with more cornstarch until it is. Don’t attempt to wash or rub the area—both will drive the grease deeper into the upholstery. Finally, tufted furniture can be a magnet for dust and mystery dirt. Blast dimples clean with a can of compressed air, followed by a quick vacuum with the upholstery attachment.